It’s here, it’s here! Cherry season is upon us. One of the tastiest times of the year, if you ask me. 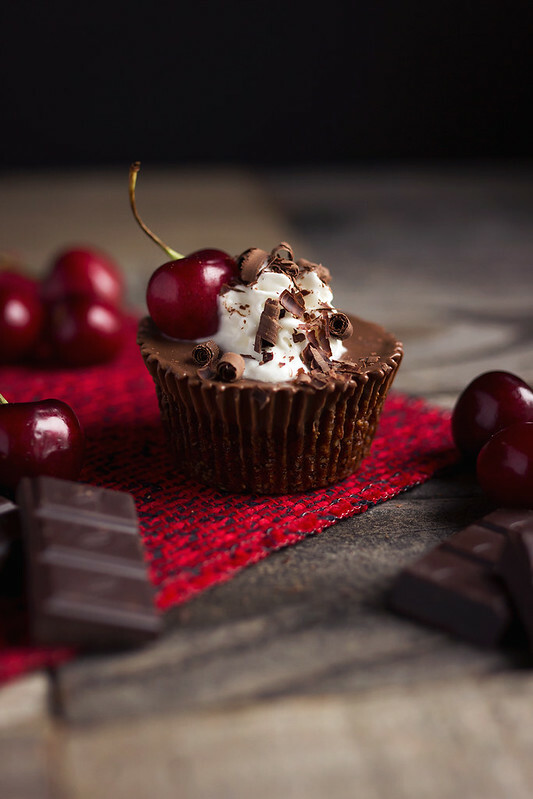 Naturally, to know me is to know that one of my favorite ways to pair them is with chocolate. Because chocolate seems to be my answer to all of life’s questions, even the ones not being asked. 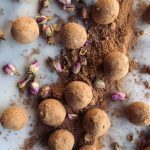 I love chocolate so much that I have been known to keep a bar of 85 – 90% dark chocolate in the freezer or fridge at all times. A small square of that goodness after a delicious dinner, that’s really all I need in life. Except maybe these tartlets, these are pretty amazing, too! By the way, that 30+ days I did on the Autoimmune Protocol, skipping chocolate completely throughout the entire process was harder than anything else. I did it, but I wasn’t happy about it. 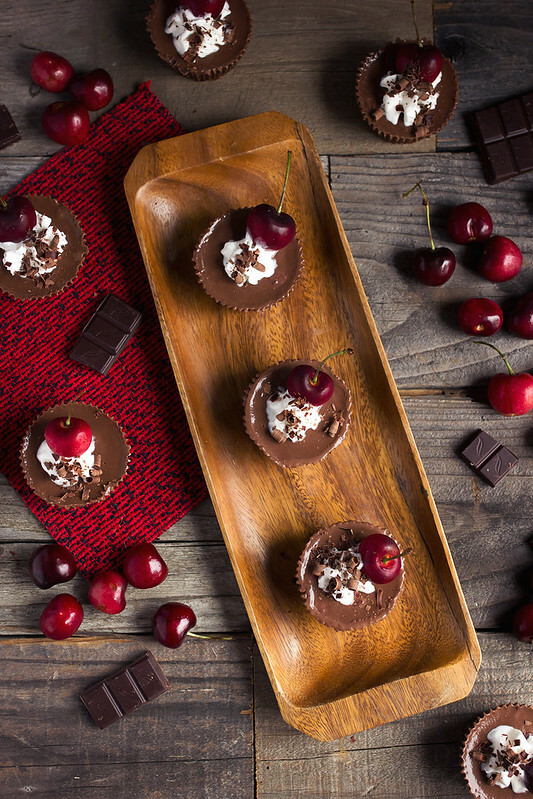 These pretty, naturally grain-free and vegan chocolate cherry mini tarts, have a delicious nut-based crust, filled with a rich and smooth, cherry-flecked ganache and topped with homemade coconut whipped cream. 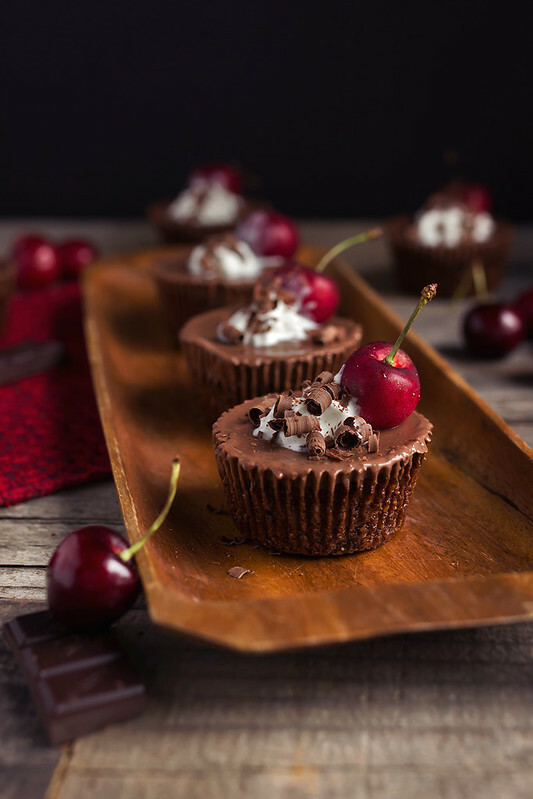 I super excited to announce that I will be making these Grain-free Black Forest Tartlets this Wednesday evening, June 10th, at the Whole Foods here in Long Beach as part of my FREE Summer Eats cooking demo. I will be making four delicious, gluten-free recipes, which also all happen to be paleo and vegan-friendly, too. From 6-7:30pm we will celebrating the best of what’s in season right now with some delicious sweet and savory delights, which will also all be available for tasting. So, if you are in the Southern California area, you should join us! You can RSVP here. Preheat oven to 350ºF. Line 12 cups in a muffin tin with paper liners (you could also use greased mini tart pans). In a large bowl, add all of the crust ingredients and mix very well. Really get your hands in there to get it all together and work it into a nice dough. Add the crust mixture to the muffin cups and press down firmly into the cup using your knuckles, going up the sides a tad bit. Bake for 15-20 minutes until golden brown. Allow to cool in the pan for about 10 minutes, then place the pan in the refrigerator for about 20 minutes or so, while you make the filling. 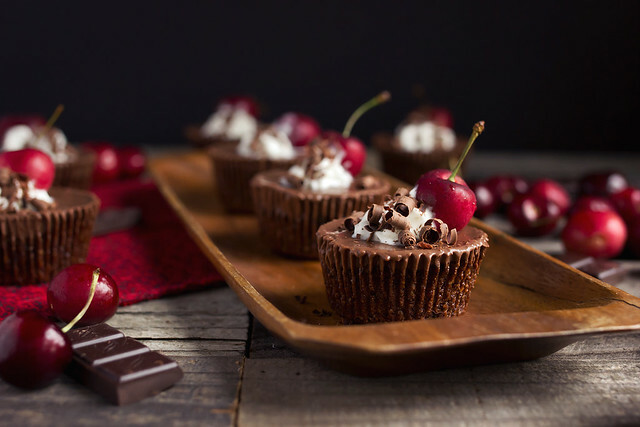 Place the chocolate in a large bowl and set aside. In a small saucepan over medium-high heat, bring the coconut milk and coconut oil to barely boiling. Remove from the heat. Pour the coconut milk over the chocolate and let sit for a minute or two. Then begin stirring with a spatula, so that the chocolate melts. Continue stirring until the chocolate has fully melted, then fold in the roughly chopped cherries. Add the vanilla extract and a pinch of sea salt. 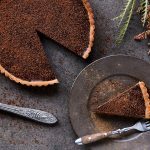 Remove the tart shells from the fridge and pour the chocolate filling into each shell. Making sure to disperse it evenly. Place the muffin pan into the freezer and let set a few hours or overnight. Remove from the freezer, about 15-20 minutes before you are ready to serve, remove the papers as soon as you take them out. 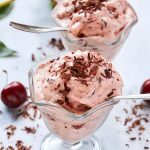 Top with freshly whipped coconut cream, chocolate shavings and of course, a cherry on top! Enjoy. These little tartlets are gorgeous! I’m always so excited when cherries are in season. Can’t wait to try them out! 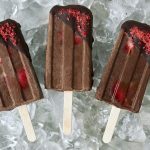 Any chocolate berry combination is amazing so I have no doubt this is wonderfully decadent! Ahh – how I wish I could be there to watch you work your magic. These tarts look to die for and I’m jealous of anyone who gets to eat them! Yum! Any marriage of fruit and chocolate and I am there!